When it comes to Public Relations, few companies gain as much media exposure as Apple. At times, the technology giant’s PR department is more impressive than most at shaping and controlling discussion about its products, particularly when it comes to product launches, yet remains notoriously bad at crisis management when faced with widespread media scrutiny. The distinction between this simultaneously extreme-yet-opposite performance can be drawn between Apple’s ‘proactive’ and ‘reactive’ PR. ‘Proactive PR’ is planned and considered activity that attempts to leverage the company’s actions, such as a press release or one of Apple’s regular media events to mark the launch of a new product, whereas ‘reactive PR’ encompasses responses to unexpected events that affects the company’s reputation, with the recent iPhone 6 ‘Bendgate’ offering a prime example. Let’s start with the positive of how and why Apple’s proactive PR is so great? To demonstrate ‘the why’, just think about the prominence of Steve Jobs as Apple’s figurehead and visionary. Now think about how many paid Apple advertising campaigns you can remember Steve Jobs appearing in; the answer is none. This just demonstrates the public exposure Apple gains even if you withdraw all paid ads and media. Jobs’ stature comes from fronting Apple’s engaging ‘show and tell’ launch events, prior to his death, as well as from widespread media interest given Apple’s unique reputation. Building upon this point, more important is ‘how’ Apple produces best practice in its ‘proactive PR’. Crucial here is the translation of the brand’s cool and premium self-image into all proactive PR activity. Be it the press release, product launch event or use of an Apple product on TV, everything is carefully orchestrated to be in perfect sync and maintain this favourable brand reputation. Going back to Steve Job’s reign, he insisted on approving each press release word for word, and masterfully inserted a term for each device – such as the “magical” iPad, or “revolutionary” iPhone – which through military organisation is used in all corporate communications and subsequently rubs off on third-party PR exposure. The bottom line is that Apple consistently produces truly revolutionary products that create genuine interest amongst gadget freaks and increasingly everyday consumers of all demographics, but what Apple’s PR department does fantastically is exploit this in the run-up to launches. This includes monitoring talk and offering leaks to build excitement and anticipation that culminates with the launch event, to the point that media interest is so big that it becomes front page news in national newspapers and other media sources – media space that would otherwise cost Apple millions of pounds. Let’s not kid ourselves, Apple’s PR department more than exploits its fortune of possessing products considered to be the ‘holy grail’ of technology products. By allowing only a selected few magazines, websites and bloggers the opportunity to review products prior to launch, this puts pressure on the few to review positively to avoid Apple withdrawing this opportunity in future – a terrible scenario for technology publications. On the back of this praise, it seems out of place unnecessary to suddenly offer advice on how Apple could improve its PR practices, but room for improvement remains. Being at the forefront of such rapid advances in technology, occasional malfunctions are inevitable for Apple – last month’s ‘Bendgate’, a faulty antenna prohibiting calls on the iPhone 4 back in 2010 and inaccurate iOS Maps in 2012; to name just a few. In today’s age of new media, there’s absolutely no hiding place, but Apple seemingly tries its hardest to do so given its policy of remaining silent in the wake of bad news. To demonstrate with ‘Bendgate’, whilst Apple released a press release to celebrate a new record for sales in its first weekend, growing reports of iPhone 6 devices bending in customers pockets never warranted official comment – despite the intense media spotlight on Apple to do so. It seems bizarre from the outset, but this is all part of Apple’s strategy to remain cool and measured in its public facing image. The company doesn’t want to provide quotes that could be reprinted with criticism. Instead, by utilising its strong media relations (or control over the media, if you’d rather), Apple can usually rely upon defence from other sources with an interest in the issue, and therefore keep itself out of further trouble. The result of Tesco’s effort was 74% of customers hearing its response, compared to less than half for its competitors. Just as importantly, 68% felt it had responded quickly. 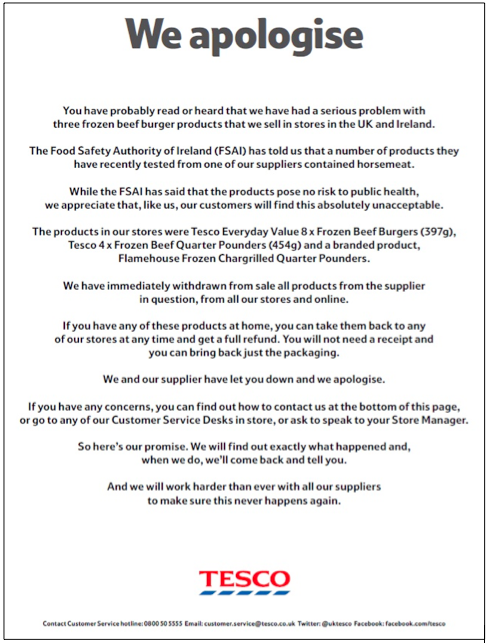 The horsemeat scandal had the potential to severely damage the supermarket’s reputation but this excellent reactive PR averted much of the media scrutiny as Tesco centered much of the conversation itself – supporting my point that negative publicity is something to be dealt with head-on, not denied. To conclude, whilst Apple’s reactive PR strategy was adequate when less of a lead player in the technology industry, I believe it fails to offer best practice as a market leader. Apple’s PR strategy in general naturally creates a divide between its advocates and haters, and relying on advocates to defend the company at all costs regardless of the matter at hand just inflames this relationship between consumers and puts Apple at the centre of more unnecessary controversy. I would argue this isn’t very ‘cool’ for a brand attempting to be just that! 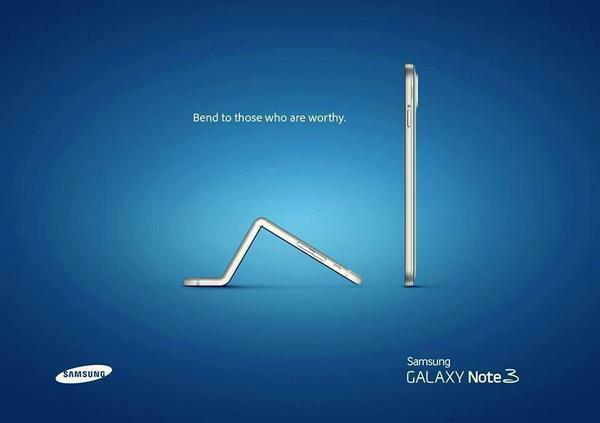 This entry was posted in Communications and tagged Apple, Bendgate, Horsemeat Scandal, iPad, iPhone, iPhone 6, Launch Event, Marketing, PR, Proactive PR, Product Launch, Pubic Relations, Reactive PR, Samsung, Steve Jobs, Technology, Tesco, Viral Marketing. Bookmark the permalink.